The glistening island of Majorca beckons from the Mediterranean Sea. Part of the Balearic Islands, its name translates to “the larger one” in comparison to Minorca, another island in the chain whose name means “the smaller one.” There is a lot of natural beauty to be explored in Majorca beyond its crowded beaches and the touristy night clubs at Palma Nova or Magaluf. While the 14th century Gothic cathedral of San Sebastian is the main landmark, every quiet corner has a religious structure. This town is nestled amidst the Tramuntana mountains to the west of Majorca. There are guided and self-led hiking trails through lush vineyards, leading to a 13th century Spanish monastery inhabited at one time by the famous music composer Chopin. Further up, the trail follows the olive trees and goes off the main road, uphill to Deia. This is a peaceful seaside village containing the early 18th century Trinidad Hermitage. Deia borders on Llucalcari, where access is difficult but worth the effort, since it has perfect swimming spots amidst isolated coves and a shore lined with pine trees. Other activities in Valldemossa include cycling trails, horse rides and rock climbs. All the stone houses have a ceramic plate at the main entrance invoking the blessings of their patron saint La Beata. Far from the beaches lies the village of Orient, hidden in the valley by three mountains; Puig Major, Puig d’Alaro and Serra d’Alfabia to its north, south and west respectively. The narrow road from Buyola with hair-pin bends will get the adrenaline pumping. The safer alternative is the approach from Alaro. A hike up to the 18th century hilltop church in honor of St. George offers a stunning view of the greenery dotted by the 20-odd honey-colored houses. There are only 3 restaurants catering to tourists. The Alfabia manor house with its exotic gardens filled with pavilions and fountains lies nearby. Cap de Formentor, the northern end of Majorca, lies close to Port de Pollenca. 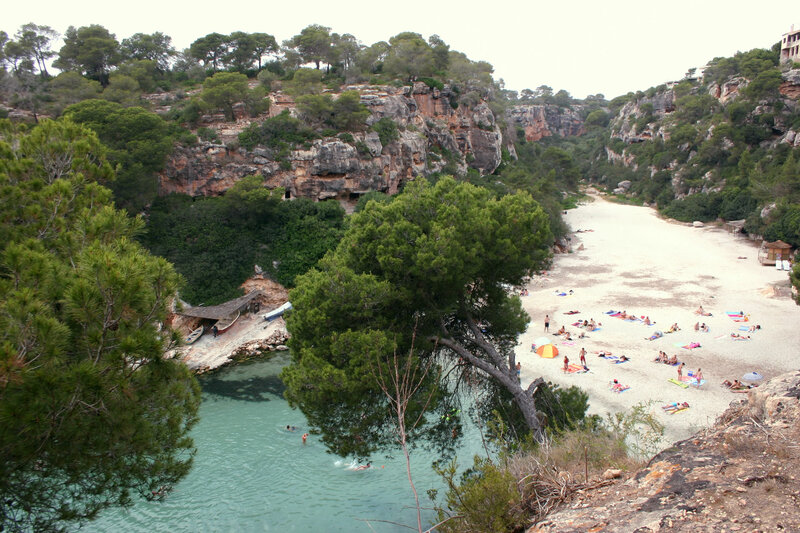 With cliffs 400 meters above sea level, white pines growing from rock formations and goats ambling about, it is immediately apparent why this is one of the most-visited spots in Majorca. The bright blue of the sea is a pleasant contrast to the yellowish rock. There is a lighthouse that looks out onto Minorca. To get good views, go early in the morning before the crowds arrive. Cuevas del Drach or Dragon Caves are another attraction hounded by tourists, but they are too beautiful to be missed while on cheap holidays to Majorca. They are found near the fishing town of Porto Cristo along the island’s east coast. These caves are filled with stalactites and stalagmites. Deep inside a cavern, Lago de Martel is the largest underground lake in the world. An amphitheater is built around it, where a unique performance of classical music takes place; from the darkness, a few illuminated gondolas gently float on the lake, while musicians on board enthrall visitors with brilliant acoustics. The crowds thin out later in the day. Catalan and Spanish are the two main languages, while English is also spoken across the island. The local time here is 1 hour ahead of GMT. Son San Joan airport just outside Palma ranks 3rd in Spain in terms of size and is one of the busiest in Europe in the summer. There is public transportation around the island and guided excursions are also available, but the best way to see Majorca at your own pace is to rent a car and drive around. Majorca is blessed with a typical Mediterranean climate. The summer months from June to August are sunny with an average temp of 25 C. This is the peak tourist season; hotels are fully booked and prices skyrocket everywhere. The mild winters last from December to February, averaging at 12 C. October to November is the best time to visit Majorca to beat the crowds; accommodation options are plenty at this time of the year. Join me for an amazing ride by La Costa del Sol?